James Sadler built his factory in Burslem, England during 1882. He quickly made a name for himself by making exceptional teapots. As these famous teapots popularity grew, so did the company and today we enjoy these charming teapots that are at the heart of many collections. These teapots are perfect for adding to a collection or starting a new one. Each teapot arrives in a gift box. Part of the Shakespeare collection, this two cup teapot honors the Bard's wife. A lovely two cup teapot from the Country Cottage Collection by James Sadler. A perfect depiction of a country inn complete with a dog in the doorway on a two cup teapot. A two cup teapot James Sadler tourist collection with a gift box. A lovely two cup teapot decorated with a colorful garden and lots of detail. A two cup teapot from the Landmark Collection depicts the famous clock tower. A vibrant London scene filled with color as depicted by this two cup teapot. A two cup cottage shaped teapot with a charming country home. 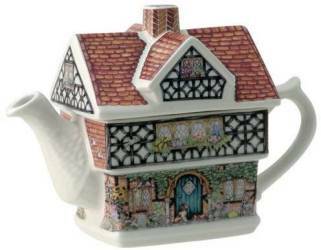 This two cup heritage style Tower of London teapot is richly decorated. A two cup teapot depicting the famous royal guards at Buckingham palace. A very detailed two cup teapot from the village series with a gift box. This tudor style two cup teapot has lots of detail. The windows look like cut glass. A two cup teapot depicting a quaint village store with beautiful details.